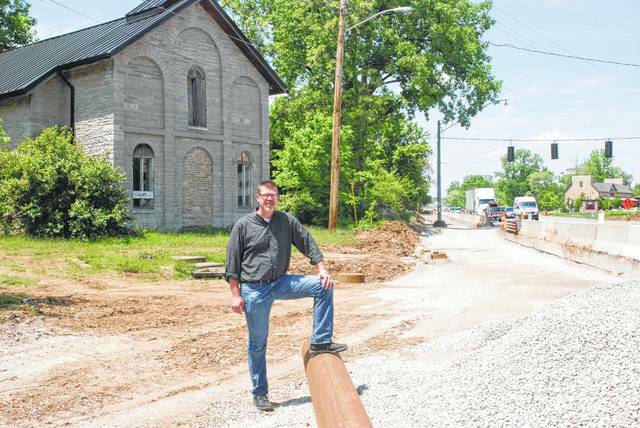 Two years ago, Dave Kerr stands in front of the old stone Methodist-Episcopal church at the corner U.S. 23 and State Route 315 two years ago when the Ohio Department of Transportation was re-aligning the intersection. After two years of ownership, Dave Kerr Architects LLC is projecting a January time frame to move into the old church building. 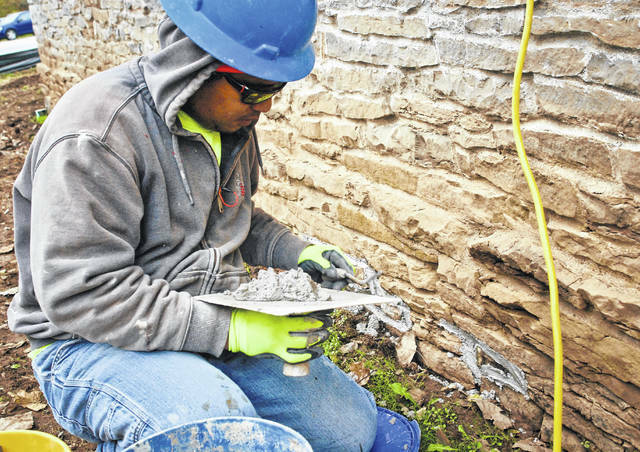 Plugging the holes in the outside of the old stone church is Tominik Phillip with Quality Masonry of Marion. So you want to take a building that pre-dates the Civil War and equip it to serve 21st century needs, eh? Kerr said the plans are to move his firm’s office, David Kerr Architect LLC, into the building in January. “We’re excited to move to Delaware,” he said. Kerr purchased the property more than two years ago with plans to renovate it to house his firm’s offices. Since that time, the Ohio Department of Transportation has realigned the intersection of US 23 and State Route 315, complete with a new set of traffic signals. Through his research, Kerr discovered that the building was listed on the National Register of Historic Places in 1991. He has worked through a seven-month process to receive a tax credit of $191,538 from the Ohio Development Services Agency. The Ohio Development Services Agency projects the total cost to renovate the building at about $996,758. Kerr said it has been a learning experience and that he can now offer historical renovation as an additional service to clients. He mentioned he is the architect for the renovation of the balcony at the Strand Theatre in downtown Delaware. Kerr said the old church was never equipped with utilities of any kind — no water, sewer, electric; it‘s primitive as can be. He said the windows will be replaced with those that reflect more of the period when the church was built. The front doors — facing US 23 — will be replaced to resemble the original doors, but the main entrance will be on the side of the building. Kerr said the roof will be replaced to resemble the original, but made from modern materials. He understands the significance of the old church to the area. “It was dedicated in 1844,” he said. Kerr said there are still people in the area who remember attending services in the church in the 1950s. To aid his research, many of the people have sent pictures of weddings being performed in the old building, giving him a glimpse of what it used to look like inside. He said the building was originally dedicated on July 4, 1844, with a reading of the Declaration of Independence. Earlier The Gazette reported, according to Sue Bauer, a volunteer for the Delaware Historical Society, that the building was last used as a church in 1958, then sold in 1960 to a private owner. Over the years, it’s been bought and sold many times to be used as many different things. It had been used as a house and lived in for a time. This entry was tagged Dave Kerr, Methodist-Episcopal, renovation. Bookmark the permalink.